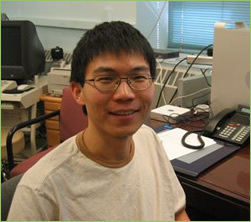 Hongzhi Wang started programming with us in August 2006, and has become involved in several projects including complex analytical issues in spiral calculations. He obtained a BS and MS in Computer and Computing Science at the University of Science and Technology Beijing, China. Hongzhi is particularly interested in computer vision, perceptual organization, and multispectral imaging. He is currently a Doctoral Student in Computer Science at the Stevens Institute of Technology in New Jersey. He was an intern in 2002-3 at the M.E. Muller Institute, Bern University, Switzerland.